Copyright 1998 - 2013 Ian Young. These notes or link to their location are not to be passed in any form to any other person without the expressed permission of Ian Young. Disclaimer: Kite Surfing can be dangerous - there has been fatalities in this sport. These notes are provided on the basis that the author will not be held responsible for any damage to any person or property arising as a result of participation in this extreme sport. It is STRONGLY recommended that you get lessons with a professional kite surfing instructor. The Western Australian Kite Surfing Association (WAKSA) www.waksa.org.au website lists schools in WA. It is recommended that you learn from others mistakes by subscribing to www.seabreeze.com.au/forums. Near misses are warnings that a more serious accident WILL happen if lessons are not heeded. To kite surf in Australia you should have public liability insurance. You can get suitable insurance by joining WAKSA via their website www.waksa.org.au. Assessing conditions and the environment is the single most important part of safety. It is very important that you know how to judge wind strength and direction accurately as well as the wind range of your kite. Initially only fly your kite in the lower half of the manufacturers recommended wind range (10 – 17 knots in this example). >25 knots Forget it unless very experienced and flying a small kite! Avoid frustration by attempting to fly in conditions beyond your equipment performance specifications or your own experience level eg flying in conditions that are too light may result in inability to re-launch off the water; launching in winds that are too strong may result in over-powering and loss of control with resultant damage to self and/or equipment. Get lessons from a professional Kitesurfing Instructor. This sport can be dangerous not only to you but also to the people around you. Always ensure downwind is clear of people and obstacles. 100m immediate danger radius. When learning, plan for 1km clear area downwind to transit in your training session. Learners should launch well downwind of other water users. Read the forecast and assess the weather (wind strength & direction/ thunderstorms) See http://www.seabreeze.com.au/graphs/ for Perth metro wind strength and direction trends & links to current forecast. To learn more about how to forecast weather visit http://www.bom.gov.au/info/ftweather/. Always fly within your own capabilities (equipment and experience) – gain experience gradually. The kite can change direction very quickly, always be aware of what the kite is doing. Initially spend 80 – 90% of your eye contact on the axis of the kite. Always use a safety leash and a quick release (QR) on anything that you hook yourself into ie main loop and/or "chicken loop" on 4-line kites. Do not let go of the bar unnecessarily - but practise using your QR so that you can use it instinctively in an emergency. Packing up at the end of each session is a good time to do this after ensuring that the downwind area where you will drop your kite is well clear of people, animals and obstacles. Board leashes can be dangerous - practice getting back to your board without the using a board leash. Consider wearing a helmet. Use the kite responsibly and never take risks, especially in terms of wind strength and safety distances downwind. Always ensure you have a means of getting back to shore. Never go out any further than you are not prepared to swim back in. Avoid Kitesurfing where the wind is blowing any more than 30 degrees onshore when learning. Avoid flying a power kite on or near land. The exception may be in very light winds. Never deliberately manoeuvre into a right of way position so that it interferes with another water user. If you are behind another kite heading into the beach, turn early to allow the lead kite room. before you launch, land, jump, jibe, etc. in the water DON'T point your board at your kite. when you fall off your board keep legs down (vertical) or behind you and keep weight on lines by leaning forward, keeping your chest over the hook on your harness. Be assertive and confident. You control the kite - don’t let the kite control you! The kite will not lift you off the ground unless you perform advanced manoeuvres and/or you have misjudged the conditions. A kite can be flown anywhere within the half hemisphere known as the wind window. There are essentially two components of kite control: spatial reference (wind window) and rotation of the axis of the kite to the desired angle. If the angle of the axis is down, the kite will crash unless you correct it. While flying figure 8 patterns do not dive your kite more than 45 degrees down. If you do not turn your kite sharply enough it will get come further to the outside of the wind window and lose power. The kite will generate different amounts of pull depending on it's position in the wind window and how fast it is actually flying (aerodynamic lift from apparent wind). Angle of attack (AoA) is the angle that the wind makes with the leading edge (LE) of the kite. Apparent wind (the actual speed of the kite through the air) is increased whenever you move either your board and/or your kite. The position of the kite within the wind window and the direction it is moving (angle of it's axis) also have an impact on AoA ie if a kite axis is climbing vertically from being low to the water it has a very high AoA no matter what the position of the bar of a 4-line kite. Parking is when the kite is completely stationary anywhere on the edge of the wind window and there is very little tension on the lines. It is also very close to a stall due to lack of airspeed over the kite and it is much less responsive. To park a kite at any desired height, the angle of the axis of the kite is set and will extend back to the overpowered zone ie when low to the water the axis is just above horizontal. There will nearly always be a delay between a rotation of the axis before a movement of the kite. Concentrate on the angle of the axis rather than the movement of the kite otherwise you will find yourself over-correcting the kite - this will make it difficult to get back to then onto your board. Be careful when turning the kite from the edge of the wind window (especially when launching on the beach). The kite is close to stall here and may initially not appear to respond to your control input, however once a rotation of the kite starts it can accelerate very quickly and can easily fly through the overpower zone unintentionally. Keep the angle of the axis below 30 degrees when low to either side of the wind window until it starts to respond. When a kite is at the extremes of AoA there is a danger of the kite luffing or stalling. A stall is when the kite starts to drift backwards - this is caused because the wind over the kite has dropped too low and/or the angle of attack is too great and the drag is greater than the lift. To rectify a stall, depower a 4-line kite and/or give the kite additional airspeed by flying the kite in a gentle side-to-side pattern. A luff is when a kite flies beyond the edge of the wind window or when turbulent wind hits the top of the kite and it collapses - this can be very dangerous - it is caused because the kite has too much momentum, usually as a result of gusts or turbulence - this can be avoided by assessing conditions properly. To prevent a luff stop the kites forward momentum by pulling maximum drag (sheeting in) on a 4-line kite and/or turning the kite in a side-to-side pattern to avoid it flying past the edge of the wind window. When hooked into the "chicken loop" of a 4-line kite you are hooked into the front (LE) lines and the ends of the bar are connected to the back (TE) lines, so when you pull in on the bar you are pulling the back of the kite down ie increasing AoA. For any constant AoA, both lift and drag as apparent wind increases over the aerofoil. Lift and drag also both increase as AoA increases for a constant airspeed until the AoA is so great that the increased drag causes the kite to stall. The efficiency of an aerofoil is referred to as it's lift to drag ratio or L/D. Lift - the kite will pull a little bit harder (NOT a lot harder) - power comes from where you put your kite NOT where you put your bar. Drag - the kite will fly slower, this is useful in preventing a kite from flying past the edge of the wind window and luffing. Sheeting-out is sometimes called de-powering because the reduction in drag allows the kite to move further to the edge of the wind window where there is less pressure. As your confidence increases you can make your "figure 8" patterns deeper into the core of the wind window to generate more pull. You will get smoother power by turning sharper by using a more aggressive pivot action with the bar then letting the kite fly in a straight line. Aim for constant speed through the water by keeping the kite moving in a smooth rhythm in the planing zone. Keep your legs down and/or behind you to keep in a stable position – if you lay back with your feet in front you run a very real risk of being flipped over onto your back and being dragged upside down underwater until you crash your kite. When first venturing into the ocean, body drag with a gentle left or right pattern (as applicable) away from the beach until you get beyond the surf zone - lean on your board rather than try and drag it behind you. Pre-flight inspection - assembled correctly and checked for correct bridling, pulleys, bladder pressure, signs of wear or damage to fabric, etc. bar - flying lines even and free from tangles, safety leash, line attachment points, quick release, etc fully operational. personal Gear - helmet, wetsuit, buoyancy vest and harness completely done up and free of tangles. board - foot straps adjusted, screws tight, fins OK. The key to getting onto the board is maintaining KITE control! Launch your kite (as per manufacturers recommended method) on beach or in shallow water. Body drag until clear of surf zone if applicable. Park kite directly overhead and keep it perfectly stationary with your left hand only. Keep your feet down at this stage. Hold the board by the right foot strap or handle with your right hand. Position your board in front of you so that the pull of the kite is between your foot straps. Everything should be lined up along the wind line - NOT twisted off to one side. Gently lay back in the water against your harness hook - initiated with your head and shoulders almost touching the water behind you directly into the wind. Bring both knees up towards your chest. Do not twist left or right at all. Do not pull on the bar with your left hand. Put your right knee on top of the board just inside your right hand and tilt the board against your knee with a wrist action to bring the board vertical. Immediately LOOK DOWN and gently put your left foot in the foot strap - do not kick your left foot out straight ie keep your knee bent up close to your chest. Let go of the foot strap with your right hand and grab the bar to regain two-handed control of your kite. Last of all put your right foot in the foot strap. Keep both knees only slightly bent and sink the board's rail deep in the water with your heels and keep the board vertical in the water by pulling back on your toes. Do not bend one knee more than the other just yet. Use your stomach muscles and your kite control to keep the pull of the kite between your feet. If the kite starts to pull outside of the area between your legs then ditch the board early, otherwise you risk being pulled over onto your back and crashing the kite. If you ditch your board early it will only be a few metres behind you - if you have to relaunch your kite your board will be 100m or more behind you - the priority is ALWAYS the KITE! To head left, park the kite on the right edge of the wind window, select the required height depending on the wind strength (usually it will be about 10-15m above the water when learning underpowered). Turn the kite sharply to the left to get a good horizontal power stroke across the water-start zone. Push down evenly with both heels to use the board as a fulcrum to be levered up out of the water, lean back against the pull of the kite through your harness - do not take too much pressure in your arms - if you do you will be unlikely to to steer your kite effectively. Keep your legs fairly straight until you feel your bum come out of the water, then bend your back knee and place approx 60% of your body weight on the back foot to allow the board to accelerate and start planing about 45 degrees downwind. It is unlikely that you will have developed enough board speed to lock your kite off at this stage, so you will need to turn your kite back to the right (but not past the downwind line) and commence the same left hand figure-8 pattern that you did when you were body dragging ie dive left down at 45 degrees then, hard right up at 45 degrees. In stronger winds you will not need to turn as hard - but you should always develop your skills and experience in lighter winds! As your board speed increases reduce the size of your figure 8 pattern until the kite locks off ie keep the axis horizontal and about 5-10m off the water at the side of the wind window. The kite can be locked off in the planing zone only when you have enough board speed - this is due to apparent wind - see section on going upwind later in this text. Once you are up and planing you then control your speed by both board and kite control. To slow down, the most effective method is to lean back and edge your board hard so that you pull hard against the kite, keep the axis of the kite horizontal, sheet your bar out and let it fly out of the planning zone temporarily so that you slow down. 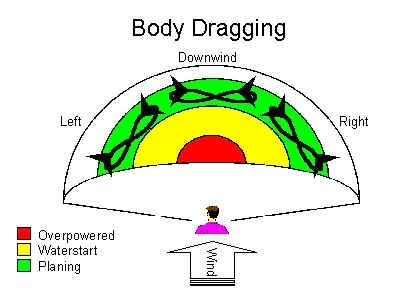 Many learners find this a little difficult and so an alternative method is to fly the kite to the parked overhead position and run downwind until your speed bleeds off – note that initially this will result in your speed increasing dramatically until your line tension decreases when the board catches up to the kite – be careful not to actually ride your board under the kite as this will luff the kite. NEVER be tempted to use a board leash. As soon as you feel that you are falling off your board, kick it off and lean forward, DON'T take your eyes off the kite, depower - if you do this your board is often very close - if you don't you'll probably crash your kite and by the time you've re-launched your board will be 50-100m behind you. Park your kite low to one side setting the angle of the axis to about 15-20 degrees up. If you have just relaunched your kite keep it to the side and low - DO NOT park it overhead as this will take you downwind away from your board. Lay on your side, fly the kite with your upper hand ie if dragging right then fly with your left hand and stretch your right hand out at an angle of about 45 degrees to the pull of the kite. Your body should act as a keel of a boat - keep your body straight from your finger tips to your toes and lean slightly forward. Count 20-30 seconds so you body drag the same distance either side - most people have a natural bias and it's amazing how far you can unintentionally drag off to one side. If you were riding to the left when you fell off and/or crashed your kite then your board is most likely upwind to your right BUT still only drag 20-30 secs each side until you spot your board. If you cannot see your board park your kite low to one side as sheeted-out as possible and start counting 20-30 secs then slowly bring your kite up and over the other side of the wind window - search for your board in the arc (approx 45 degrees) between your kite and your out-stretched arm - be disciplined and keep doing it until you spot your board. If you are not in a current or took a long time to re-launch and have been dragging 3 or 4 times then you may have passed your board so park overhead and look downwind. If your board is upwind of you stay sheeted-out. As soon as it is downwind of you sheet-in. To start with, go out in one direction, stop and fall back in the water, then water start again on the opposite direction. Once you are comfortable in both directions then you can practice your turns while planing. On a Twin-tip or wakeboard initially bring your kite higher and start to slow down, then once the kite is overhead quickly dive to the opposite side and transfer your weight from one foot to the other - the board should stop then slide back in the opposite direction. If you have a strong bias ie natural or goofy footer from surfing, waterskiing or snowboarding you may prefer a directional or mutant board riding heel-side one direction and toe-side (forehand) the other. To practice riding toe-side, start by doing long down-wind slalom runs gently turning either side of the downwind line, start off with less than 30 degrees either side then as your confidence and balance improves, lean out harder and turn further and further either side until you can go upwind either side. When going toe-side you need to lean out against the pull of the kite – the feel and stance is similar to water skiing on a single ski going to the right if you are a natural footer. To start with use both hands and twist your upper body – after a while you will be able to let go and fly with one hand and straighten your body. For a natural footer to water start on a right-hand tack you start with your board facing to the left and the kite parked to the left. As you dive the kite across to the right you follow it with the nose of the board, sink the back of the board pivoting on the tail then as you come up out of the water accelerate the board downwind then quickly across onto your toe-side rail. As your board speed increases, the wind window swings around behind you. This is because the wind appears to the kite to be a combination of the real wind and the opposite direction of your movement – this is called apparent wind. As shown in the following diagram, if you try and fly your kite too far towards the front of the board you will fly your kite out of the planing zone and you will fall back into the water. Position kite within the wind window for desired speed and heading. In stronger winds the kite will "lock" into a stationary position relative to the board. Try and visualise the vector forces involved. If the wind drops and/or your speed drops because you have allowed the kite to fly beyond the planing zone then start small figure 8 patterns again and head a little downwind until your speed picks up and you build up your apparent wind again. Remember that as your speed across the water increases so does the apparent wind strength and direction, so be careful not to drive the kite too far to the "edge" of the wind outside the planing zone.